Marc Levers on the puck against MK Lightning. 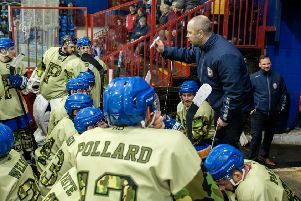 Phantoms coach Slava Koulikov believes his team have given themselves solid foundations on which to build a challenge for English Premier League success. The city club have won half of their opening six games of the new season – no mean feat considering they faced back-to-back weekends against reigning champions Basingstoke and title favourites Milton Keynes. Two of the club’s three victories so far arrived against the Bison to follow up a 6-1 drubbing of Swindon in their first home outing. Phantoms have lost home and away to arch-rivals Milton Keynes after also slipping up in lacklustre style on the opening night of the campaign in Sheffield. Koulikov said: “To reach the end of September with a 50 per cent win rate is pleasing. “We have probably had the toughest start of any team in the league with top sides like Basingstoke and Milton Keynes in successive weekends. “We want to win every game, but we know that is not realistic for us right now. However, we have competed well in five of our six games so far and the only disappointment for me is the performance on the opening night in Sheffield when we should have battled a lot harder to get a result. Phantoms’ pleasing start has lifted them to fourth place in the early-season standings, but things are not about to get any easier this weekend. Koulikov’s men face two of the three teams currently above them as they travel to Hull on Saturday (5.30pm) before entertaining Telford on Sunday (5.30pm). Both of those sides have won five of their first six clashes with the Pirates being surprise packages in just their second season, while Telford look strong contenders to win back the title they last lifted in 2014/15.